We offer a range of high-quality cables for computers, networks, and all kinds of peripherals, e.g. printers. Extension cables, replacements for damaged cables or for hardware extensions – Obtain the right cable at the right price.Do you require non-standard cables or excess length cables?Standard power supply cordsAll our devices usually include a 1.8 m power supply cord that is connected to an AC socket at the device. This is always included in the price. We offer a range of high-quality cables for computers, networks, and all kinds of peripherals, e.g. printers. Extension cables, replacements for damaged cables or for hardware extensions – Obtain the right cable at the right price. Do you require non-standard cables or excess length cables? All our devices usually include a 1.8 m power supply cord that is connected to an AC socket at the device. This is always included in the price. However, we also gladly provide single cables. With our special 5 metre power cords you can achieve significantly higher flexibility when placing your devices. For devices without ground wire we offer double-wire cables with euro connectors. All power supply cords are uncoiled, black and comply with international standards for such cables. VGA cables can never be long enough – for connecting cash desk monitors, touch screens, or information terminals you can order a three metre VGA cable with 15 pin SUB-D VGA connector (not an extension!). The cable is uncoiled, beige, and effectively shielded. All our devices usually include a 1.8 m data cable in a colour matching the printer’s housing – this is, of course, included in the price. However, we also gladly provide single data cables. The cables have male 25 pin SUB-D connector and a 36 pin Centronics connector. They are suited for connecting printers to the parallel interface of your PC. We provide cables of 1.8 and 5 metres in length. Please order your cable according to the colour of your printer in black or white. All our devices usually include a 1.8 m data cable in a colour matching the printer's housing – this is, of course, included in the price. However, we also gladly provide single data cables. With our special 5 metre data cables you can achieve a significantly higher flexibility when placing your devices. The cables have male 25 pin SUB-D connector and a female 9 pin SUB-D connector. 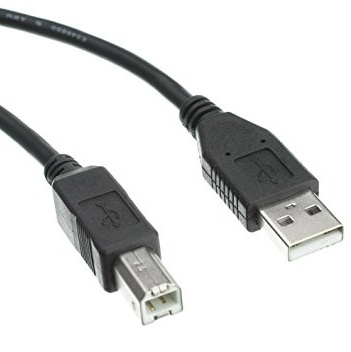 These cables are for connecting receipt printers to the serial interface of your PC. All serial data cables are wired as null modem cables. Both lengths (1.8 and 5 m) are available in black or white, so you can order them according to the colour of your printer. If you intend to use Epson printers without AC adaptor, please order the respective printer with Powered-USB interface. (For further information, please refer to the interface section for Epson cash desk printers in our online shop.) In order to use these printers, a special Powered-USB data cable is required that should be ordered separately. It supplies the printer with 24 volts. The cables are available in 1.2 and 3.0 versions and in black or white. Cable Epson DC21 - Special cable. For special applications only.